Companies are increasingly turning to renewable thermal solutions to achieve their ambitious emission reduction targets. The latest company to announce a thermal project is L’Oreal USA, which made their major announcement today at the Climate Leadership Conference, where the Renewable Thermal Collaborative hosted a workshop. 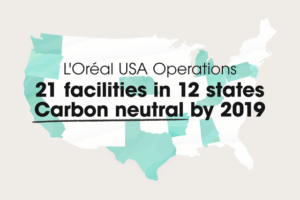 L’Oréal USA plans to achieve carbon neutrality in 2019 for all 21 of its U.S. manufacturing and distribution facilities with a financially sustainable approach that could potentially serve as a model to support new renewable natural gas (RNG) projects in the future. In order to reach this milestone, L’Oréal USA is adding to its diversified energy portfolio with RNG purchased from a new processing facility in Kentucky. The RNG purchased from the new project alone is expected to eliminate the carbon equivalent of 1.8 million gallons of gasoline consumed per year. Read the full story from L’Oreal here. Other large companies are also recognizing that renewable energy goals cannot be achieved without considering the need for renewable thermal solutions. When international brewer HEINEKEN announced a new ambition to reduce their CO2 emissions in February, they explicitly highlighted the need for renewable thermal solutions. The company aims to grow its share of renewable thermal energy and electricity in production from the current level of 14% to 70% by 2030. According to the company press release, HEINEKEN’s energy footprint in production is driven by thermal energy, which it uses to heat the boilers needed for brewing and by the electricity needed for the production process. The split of this energy mix is currently 70% thermal and 30% electricity. Today 7% of the thermal energy used by HEINEKEN is powered by biomass and biogas, and they acknowledged that making progress in renewable thermal energy is much harder to achieve than on the electricity side. The Renewable Thermal Collaborative (RTC) serves as the leading coalition for organizations that are committed to scaling up renewable heating and cooling at their facilities and dramatically cutting carbon emissions. The RTC is the only place to focus on renewable heating and cooling and where large thermal energy users come together collaboratively to understand the problems in the market, learn from each other, and overcome these barriers to renewable heating and cooling.